Groove Juice Swing offers classes on a broad range of Jazz Age and Swing Era dances: swing dance, Lindy Hop, Charleston, Balboa, Collegiate Shag, vernacular jazz dance, and more. Not sure where to start out? Check out our How It Works or FAQ pages! Preregistration for classes online (here!) closes at 1am the morning of the first class of the series. Preregister to get a discount, or sign up at the door the first day of class! 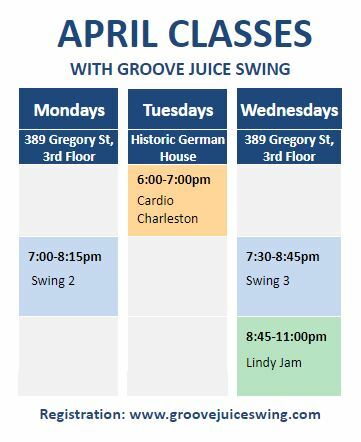 If a 4 week series isn't for you, we encourage you to drop-in at the door to either our Cardio Charleston fitness class, or our free beginner swing dance lesson. The free lesson is held every Wednesday at 9pm during Lindy Jam, our weekly social dance. One class for $8 or buy a 6 class punch card for $40. Cost: $8 preregistered. At-door registration price is $8 if space is available. Finally, a swing dance class that is focused on fitness. Join us once a week for an hour of dancing minus the starting, stopping, rotating, and waiting around. We will teach fundamental solo jazz and Charleston steps, integrating them into a fast-paced class to make sure you get a fun and energetic workout. If you've never tried solo jazz, this is a fantastic way to get started! All levels of dancers are welcome. Cost: $50 preregistered. At-door registration price is $60 if space is available. Whether it’s your first time partner dancing or you're adding swing to your repertoire, this class will teach you all you need to have fun on the dance floor! You’ll start out with some easy and fun moves that will have you smiling right away, and then progress through some foundational skills that will prepare you for future Lindy Hop classes and the wide world of swing dancing! During this class, we will cover the basics of dancing to swinging jazz without a partner. Explore musicality and self expression, learn techniques and classic aesthetics, and expand your swing dance vocabulary! No previous experience with jazz dance is expected. This class will teach you what to do when the music is too slow to swing out. We will be working on footwork, new rhythms, call & response, and moves that work well to slower tempos. Whether you are dancing to a gritty New Orleans tune or a jazz ballad, we have the moves for you! Generally, class sessions are 4 weeks long and begin the first week of each month. Each class session generally consists of 1 class night per week. They become open for registration when they are posted on this page, at least 2 weeks before their start date. If you have special requests or would like more information about classes, send us an email at info@groovejuiceswing.com. Take a look at our FAQ list to see if it's already been answered!